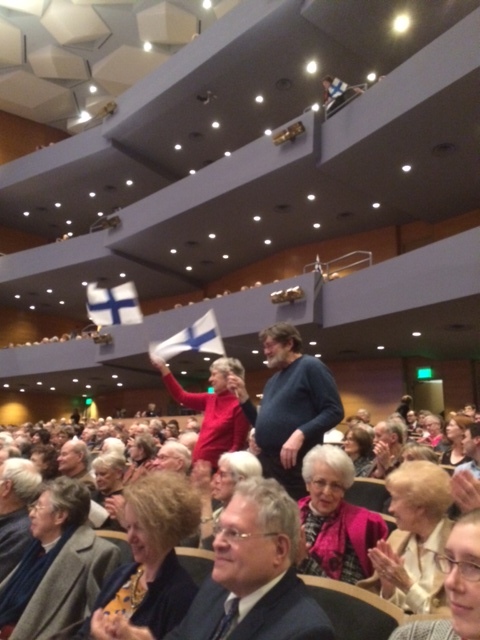 Finnish flags waving in the audience and repeated standing ovations greeted Finnish conductor Osmo Vänskä and the Minnesota Orchestra on Friday night during a glorious evening. It had been a long time since they had heard them, and they were ready– full house! And the orchestra that had been locked out for over a year in a most un-Minnesotan way played their heart out. Afterwards, Vänskä signed and signed the 2014 Grammy winning CD with Jean Sibeliues Symphonies 1 and 4, exactly what he and his orchestra had just so splendidly performed. Clearly, he has won not only Minnesota’s Finnish Americans’ but all Minnesotans’ hearts, and they all want him to stay. But he resigned in frustration at the end of the nasty labor conflict and although negotiations about a new contract are under way, no one knows for sure how they will end. The 474-day lockout resulted in the longest symphony work stoppage in US history. The orchestra’s CEO was forced to resign the other day, which raised the hopes of its many fans that Vänskä, the music director since 2003, would be coming back. And today, just hours before the concert, eight Board members resigned, one more step in what everyone says is a necessary cleaning house process. We’ll see, but Friday night was for celebration and joy, and the public seemed ready to forgive and come back…if only Osmo stays, and, frankly, I don’t see how it can end any other way.